Martin Gauss is the Chairman of the Executive Board and CEO of airBaltic since Nov 2011. Under his leadership airBaltic was restructured to profitability. The decision to purchase Bombardier CS300 in 2012 let airBaltic to become the launch operator for that aircraft in 2016. Martin Gauss is in the aviation industry for over 25 years and he started out  as a pilot on Boeing 737 with British Airways subsidiary Deutsche BA in 1992. 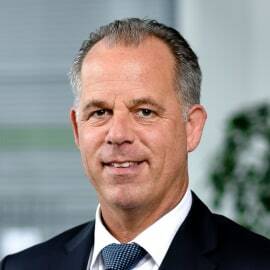 From 1995 he was working in different management functions of Deutsche BA, and became a joint Managing Director of Deutsche BA (dba) and 10% stakeholder when the carrier was acquired by the Intro Group of Hans Rudolf Wöhrl. Under Martin Gauss dba became profitable and was sold to Air Berlin in 2006. He has also held CEO positions in Cirrus Group and Malev. Martin Gauss still holds a Captains licence on a Boeing 737s.